AccountSight offers a very rich and powerful reporting tool along with the time and billing software. It gives an array of options for the users to slice and dice data for analysis and present reports for time, expenses and invoices separately. These reporting features make AccountSight a unique employee time management software. 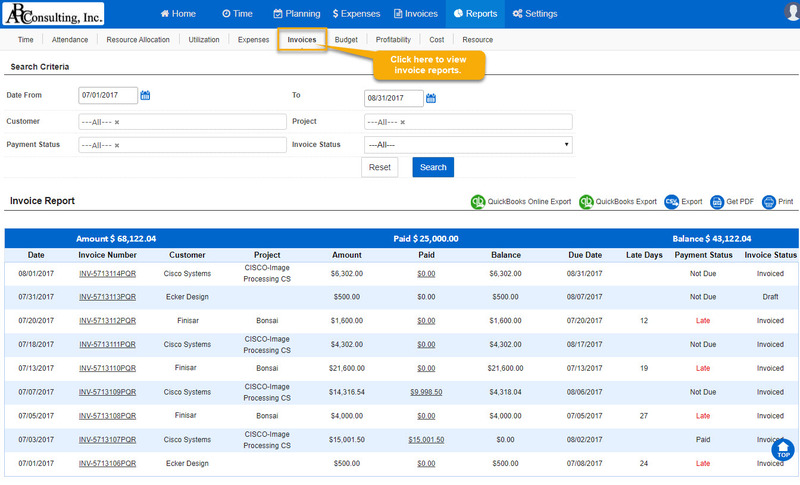 Invoices by invoice dates, customer and projects with invoicing status and payment status. Report provides details of invoiced amount, paid amount, balance due, any write offs, late days. This report can be synced to QuickBooks also directly. 3] Within Reports, go to the Invoices sub tab. 4] Choose the filters as per your requirement. Select the Time Period. Select the Customer(s) and Project(s). 5] Also select Payment Status and Invoice Status. 7] Once you have your desired list of entries, you can transfer the data into files. Click on Export to get the data in an Excel file. 8] Click on Get PDF to get the data in a pdf file. 9] Click on Print to get a print out of the datasheet.